The vocal repertoire of captive Carollia perspicillata has been initially described by Fran Porter (Porter 1979). We contributed to Porter’s vocal repertoire description by analyzing additional vocalization types and by investigating the occurrence of vocal signatures in pup isolation calls and male courtship trills (Knörnschild et al. 2013 and 2014). Moreover, Ahana Fernandez and Nicolas Fasel from the University of Bern, Switzerland, analyzed vocal signatures in aggressive vocalizations from male C. perspicillata (Fernandez et al. 2014). Echolocation calls are used for orientation and foraging (Knörnschild et al. 2014). 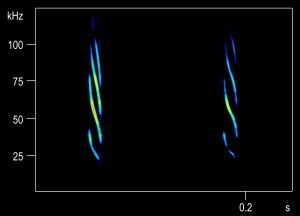 Echolocation calls of C. perspicillata (© Knörnschild). Harem males produce series of courtship trills when courting estrus females in their territories. Male courtship trills encode a distinct individual signature that probably faciliates female choice, mate recognition or neighbour-stranger recognition among male competitors (Knörnschild et al. 2014). Courtship trills are accompanied by stereotypic tactile and visual displays, such as hovering, wing flapping and poking (Knörnschild et al. 2014). Courtship trills of C. perspicillata (© Knörnschild). Both sexes produce down-sweeps during mildly aggressive encounters and warbles when aggression escalates. Moreover, harem males produce aggressive trills when defending their territory against male competitors (Knörnschild et al. 2014). Aggressive trills encode an individual signature that enables competitors to discriminate between male conspecifics (Fernandez et al. 2014). Male territorial defense comprises different and multimodal behavioral displays that are performed in a ritualized sequence (Fernandez et al. 2014). Down-sweeps of C. perspicillata (© Knörnschild). Aggressive warbles of C. perspicillata (© Knörnschild). Aggressive trills of male C. perspicillata (© Knörnschild). Both sexes produce distress calls if they are the inferior part in a physical conflict (Knörnschild et al. 2014). Distress calls of C. perspicillata (© Knörnschild). Pups produce isolation calls to solicit maternal care. Isolation calls encode a distinct individual signature. Mothers are able to discriminate between own and alien pups based on isolation calls alone (Knörnschild et al. 2013). Isolation calls of two C. perspicillata pups (© Knörnschild). 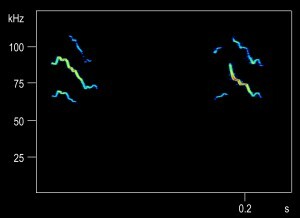 Both sexes produce wobbles in benign interactions, e.g. when several conspecifics are roosting close together and appear relaxed (Knörnschild et al. 2014). Wobbles of C. perspicillata (© Knörnschild). The behavioral context for three other vocalization types, namely V-shaped calls, flat down-sweeps and hooks, could not be determined (Knörnschild et al. 2014). V-shaped calls, flat down-sweeps, and hooks of C. perspicillata (© Knörnschild).